Researchers have discovered that African elephants in Kenya may have developed a distinctive alarm call that notifies the rest of their herd about approaching humans. A group of Oxford University scientists played a recording for the elephants of the sounds of a Kenyan tribe called the Samburu. Upon hearing the familiar sounds of the tribe, the elephants became alert, ran away, and erupted with a specific “low rumbling” sound communicated to warn the other elephants. While this kind of “alarm” system is nothing new for animals, the researchers explained that this particular sound differentiated from other alarm calls made by African elephants. For example, African elephants have also been recorded making a specific sound when swarms of bees approach, and this sound varies slightly from the human alarm sound. The Oxford researchers compared the difference in the sound to the difference between two vowel sounds used by humans. 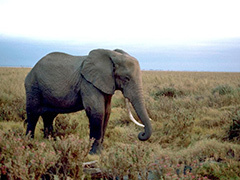 While the study was not conclusive that the sound created by the elephants is specifically used to alarm each other about humans, the recorded differences in the elephants’ alarm tones illustrates that the internal communications used by African elephant herds may be far more complex than previously thought. The new information about elephant alarm calls arrives after Hillary and Chelsea Clinton published an op-ed piece in the Financial Times late last month calling for an across-the-board ban on ivory sales in the United States. The piece, which mentions the killing of 35,000 elephants and 1,000 rhinos last year as a result of the ivory trade, points out that in recent years, loopholes in ivory sanctions have allowed the business of traffickers to run rampant. Due to poaching and changes in habitat, African elephants are classified as a vulnerable species, but perhaps the Clintons’ call to action against the ivory trade, coupled with the elephants’ advanced alarm procedures, will serve as the beginnings of a new era for these otherwise peaceful creatures.